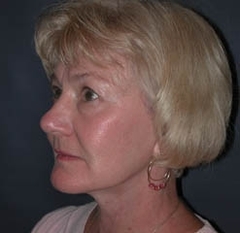 This 62-year-old woman was bothered by her prominent jowls and loose neck tissue. She wanted to improve the quality of her skin, which at the time had uneven pigmentation, large pores, and spider veins. 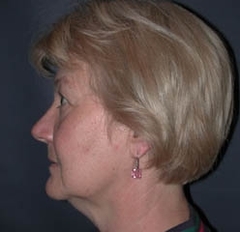 She scheduled a consultation at our cosmetic surgery center in St. Louis to discuss her options for treatments that would rejuvenate her skin and reposition sagging soft tissues. Our medical aesthetician performed a VISIA™ skin analysis to help determine the extent of her skin damage. Dr. Jones also examined her face to determine which procedure would work best for her unique physiology. Based on her facial structure and skin quality, Dr. Jones suggested a three-part treatment including physician-strength skin care, a surgical facelift, and a chemical peel. 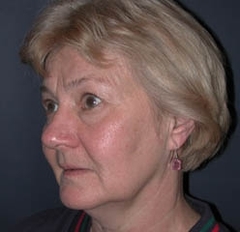 Three weeks before her surgery, the patient began skin treatments including topical tretinoin and the Obagi® skin care system. By the time of her surgery, she had already began to show visible improvement in her skin pigmentation and pore size. 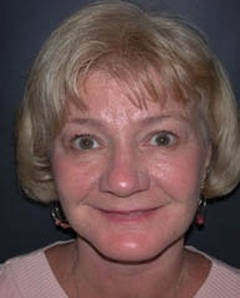 Before surgery, she was treated with an TCA (intermediate-level) peel around the mouth, eyes, and forehead. During her facelift Dr. Jones removed fat from her abdomen, purified it, and injected it into key areas such as the creases in her cheeks and between her brows, her marionette lines, and the grooves under her eyes. 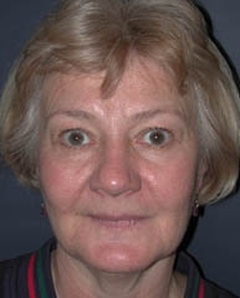 The patient experienced a normal, healthy recovery, and two weeks later started playing golf again. Three weeks after the procedure she restarted the Obagi skin care, and her photograph six weeks after the procedure shows beautiful results. The patient is very pleased with the outcome of her St. Louis facial cosmetic surgery and enjoys a much smoother, more vibrant look.